Cardinals third baseman Scott Rolen followed the most consistently excellent regular-season performance of his career with a postseason effort that was extraordinarily erratic. In 2004, the Cardinals won three of four games against the Dodgers in the National League Division Series, even though Rolen went hitless. In the 2004 regular season, Rolen achieved career highs in home runs (34), RBI (124), batting average (.314), on-base percentage (.409) and slugging percentage (.598). His RBI total was second only to the 131 of the Rockies’ Vinny Castilla in the National League. Rolen also was named a National League all-star in 2004, won a Gold Glove Award and finished fourth in the league’s Most Valuable Player Award balloting, behind Barry Bonds of the Giants, Adrian Beltre of the Dodgers and teammate Albert Pujols. However, Rolen missed 16 games from Sept. 11 through Sept. 27 because of a calf strain. He still was experiencing soreness in the calf when the Cardinals opened the Division Series versus the Dodgers on Oct. 5, but he told the St. Louis Post-Dispatch he was “close to being close” to 100 percent. What happened next was unexpected. 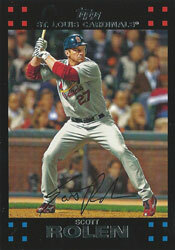 Rolen played in all four game of the Division Series and was hitless in 12 at-bats. He did walk six times, so along with a .000 batting average for the series Rolen had a .333 on-base percentage. Cardinals hitting coach Mitchell Page said he told Rolen that six walks are as good as six singles. Rolen, though, acknowledged he had fouled off pitches he should have stroked for hits. Then, in the World Series versus the Red Sox, Rolen slumped again, going hitless in 15 at-bats.